** YELLOW CORN FOR ANIMAL FEED GMO, GRADE #2. BRAZIL ORIGIN ONLY. Brazil is one of the largest producers of Yellow Corn in the world, 2nd only to the United States. Brazil production consists mainly of Yellow Corn for Human Consumption and Animal Feed. A Small percentage of the Yellow Corn grain cultivation is to meet the consumption required domestically in Brazil with the rest being imported worldwide. 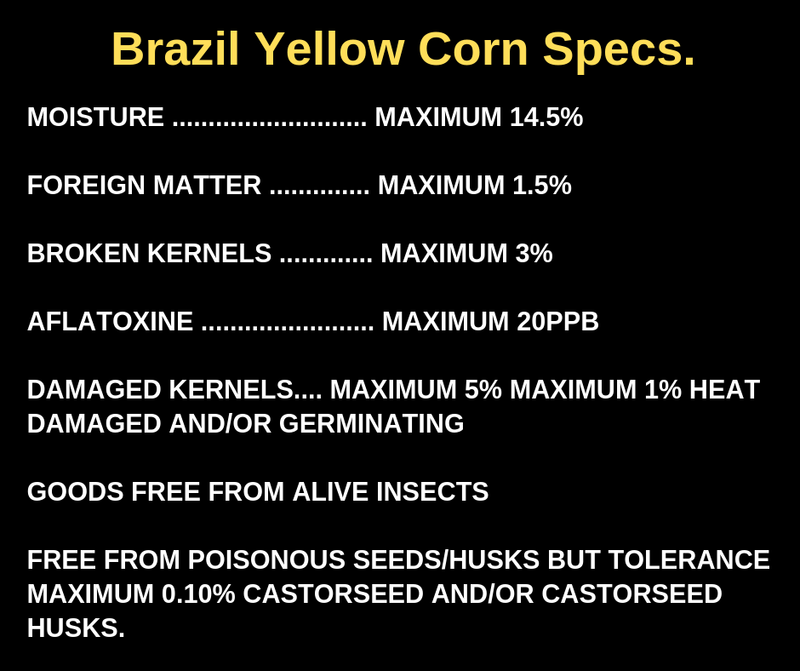 Shipfrombrazil.com assists International Buyers, importers and Agents seeking Bulk Yellow Corn GMO from Brazil. – 30 Percent Deposit with 70 percent due once Yellow Corn is delivered at the Port of Santos. We strive to provide Top Quality Service for Yellow Corn Exports from Brazil and request for Buyers to adhere to our process for pricing. *** Buyers and Agents are requested to provide an Official Letter of Intent before we provide quotes for CIF Shipments. *** We shall only provide FOB Prices without a LOI. *** We do not provide pricing or shipment for Quantities under 12,500 MT and we do not work with Container Shipments. PLEASE FEEL FREE TO CONTACT US FOR ALL YOUR QUESTIONS FOR BRAZILIAN YELLOW CORN GMO ANIMAL FEED.